Time for a patriotic stitch along! Our project is One Nation from Bygone Stitches. We'll be getting together to work on this gorgeous flag once a month on the fourth Sunday from January through June. Join us for open stitching on the third Sunday of the month. Doors open at 12:30. Join us to work on your choice of any of With Thy Needle's seasons in Baltimore. One of the sessions in the summer we'll all work on finishing our stitching into an oval box. Join us on the fourth Monday of the month to work on your wool applique projects. Our group leader, Teri Hedrick has done lots of wool work. She's can provide lots of advice to beginners as well as more experienced stitchers. Come spend Saturday night with the Crafty Ewe. Doors open at 6:30. Join us for an evening of laughter and maybe a little stitching. 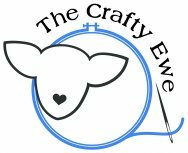 Stop into the Ewe for an evening of wool stitching. Bring your wool applique project or pick out a new one.